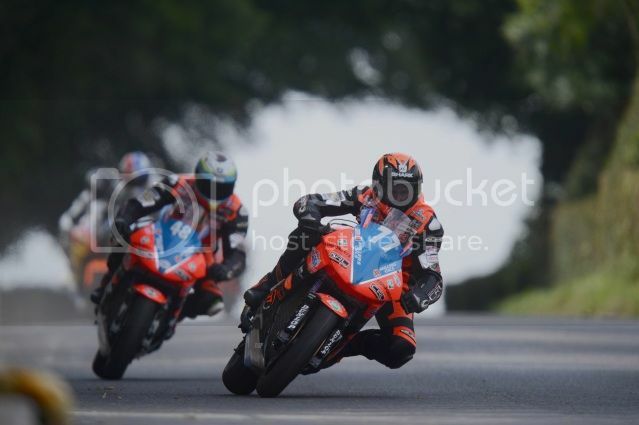 Ryan Farquhar ensured his International road race season ended on a high note when he claimed victory in the Supertwins race at the Ulster Grand Prix on Saturday. The win meant that the KMR Kawasaki rider completed the set after already having taken victory in the corresponding races at the Isle of Man TT and North West 200. With perfect conditions around the 7.4-mile Dundrod circuit all week, things got off to a slow start for Ryan when he struck problems in practice for Thursday's Dundrod 150 Superbike race but he bounced back to take a commanding 11.5s win in the day's Supertwins race whilst team-mate Jamie Hamilton took a strong second to give the team another 1-2. Starting from the third wave, Ryan then took 13th in the Dundrod 150 Superbike race, using the event to further dial in the ZX-10R Superbike. Hamilton took 14th on his Superstock mount. Saturday's main race day again saw ideal weather although strong winds kept the riders on their toes and it couldn't have started better for Ryan as he dominated the Supertwins race from start to finish to claim his 9th Ulster GP victory. With a new lap record of 118.461mph, almost 2mph better than his own previous best, he crossed the line comfortably clear of Hamilton as the team claimed yet another 1-2. With the Superbike working a lot better, Ryan then took a fine fifth in the second Superbike race as he lapped at almost 132mph and this was backed up by sixth place in the first encounter to ensure a strong day all round. Hamilton also enjoyed a good day and in addition to his Supertwins podium, he took 11th in the Superstock race and 12th and 15th in the two Superbike races. Meanwhile, Geoff McMullan took 11th and 13th on a third KMR ER6 Kawasaki in the two Supertwins races. Speaking afterwards, a pleased Ryan said, "On a personal note, it's been a successful week and to complete a treble of International wins on the Supertwins machine is brilliant and something I've wanted to do all year. I managed the feat in 2005 on Nick Morgan's 600cc Supersport machine but to do it on a bike I've built and prepared myself is truly satisfying and very rewarding. I had no problems in either race and to add almost 2mph to the lap record was superb. To get a 1-2 in both the Ulster GP race and Dundrod 150 race is brilliant for the team too so I'm very pleased for Jamie too as well as for Geoff who enjoyed his two races." "I struggled a bit with the Superbike at the beginning of the meeting but, slowly but surely, managed to get it working better and better. I was struggling to wrestle the bike through the corners in Saturday's first race but made a few tweaks to the chassis for the second and to lap at almost 132mph on my own and without a tow was very pleasing. It's the best the bike's ever been so if we can keep chipping away, hopefully it will do the business in whatever races I contest in 2013. It was good to see Jamie respond well too after a few recent crashes and I told him after Armoy that he's got plenty of time and he doesn't need to try and do it all at once. You have to treat the roads with respect and know when to go for it and when to settle for a result and he's enjoyed his races again this week." "I've now moved onto 199 career road race wins so, hopefully, I'll be able to make it 200 before the year's out so a big thanks to all the sponsors and to all the lads who've helped me both this weekend and throughout the week. The week has obviously been overshadowed though by the sad death of Lee Vernon, someone who loved his road racing and always gave 100%. He was never without a smile on his face and was a very talented rider so I'd just like to pass on my deepest condolences to all his family and friends." Ryan now heads to the Manx Grand Prix where he has rides in the 350cc and 500cc Classic races as well as the Post Classic event. Thursday, 14th March, Bar Doe, Main St Cookstown, All being well, I will be running a quiz night, where the funds raised will be divided between the Injured Riders Fund and the MCUI Medical Team. I appeal to ALL Competitors to support this quiz night, after all, It is both parties, who look after you if you have an accident! There will also be a raffle at half time. Teams, max 5 persons per table @£5.00 per head, which includes some grub as well! !